President Obama visited Tampa today, making a stop at Hillsborough Community College. All tickets were given out within a few hours of the announcement of his visit earlier in the week. Protesters lined Tampa Bay Blvd. beginning at 11:00 am, waving signs with slogans saying “The private sector is not fine”, “Where are the Jobs” and “January 21, 2013 – The end of an error”. 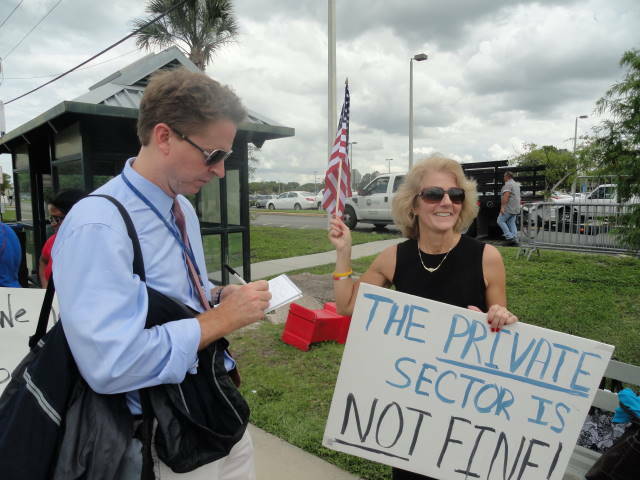 Sharon Calvert, co-founder of the Tampa Tea Party and candidate for Hillsborough County Board of County Commissioners District 2 came out and joined in the sign waving, speaking to the press of the need for a better economic environment to help increase the ability of people to start new businesses and grow existing businesses. Regulations and bureaucracy, along with an overall uncertainty of the future as it pertains to taxes, health care, etc., are holding back the economic growth that Tampa, Florida and the nation need to climb out of this prolonged recession. Although unemployment has dropped significantly since Rick Scott was elected governor of the state of Florida in 2010, it is still higher than the national average – 8.6% as compared to the national 8.1%. These numbers do not reflect the number of people who have dropped out of the workforce, or are under-employed. Lines began forming around 11:00 am to get into the gymnasium for the event. President Obama was expected to arrive at about 4:00 pm, after a rally in Orlando, Florida with the National Association of Latino Elected and Appointed Officials at Disney World’s Contemporary Resort. His message? Republicans are responsible for the gridlock in Washington, D.C. preventing immigration reform and economic recovery. This race is going to get very ugly! WHAT A HUGE WASTE OF RESOURCES, that America is paying China for.